Swiss chocolate. Nearly everyone in the street will immediately tell you those words reminds them of milk chocolate, triangular chocolate pieces in a box displaying mountains or even worse… purple cows. Oh how little people know about real chocolate. Luckily there is more than meets the eye. Switzerland, just like Belgium, has always been known as a chocolate country. Yet only recently brave chocolate makers start stepping to the plate to create origin chocolate from the bean on. An email by Suzan Inan from the new Geneva based chocolate maker Sadé Chocolat caught my eye. Her question “would you like my non conched origin bean-to-bar chocolate?” really was a nobrainer. Off course I want to! A few weeks later a package arrived at my doorstep. 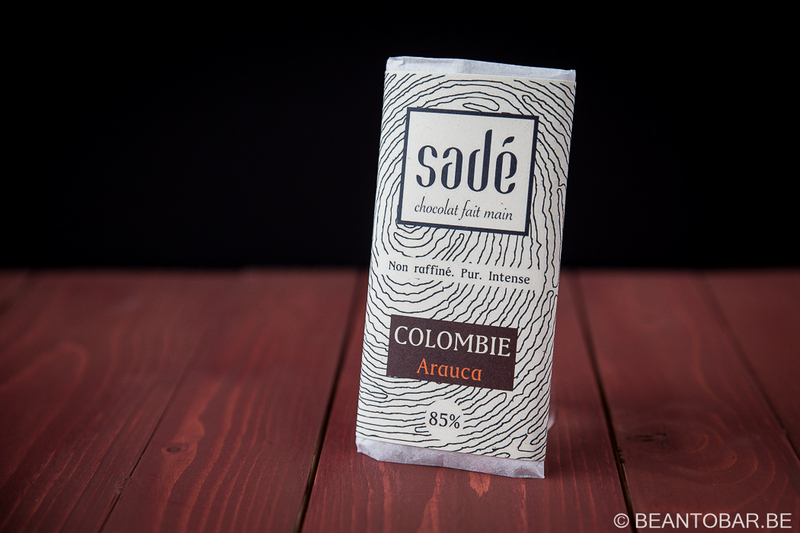 It contained Sadé’s 85% Columbia Arauca bar. Non raffiné – Pur – Intense. Goody goody. Let’s see what it has to offer. 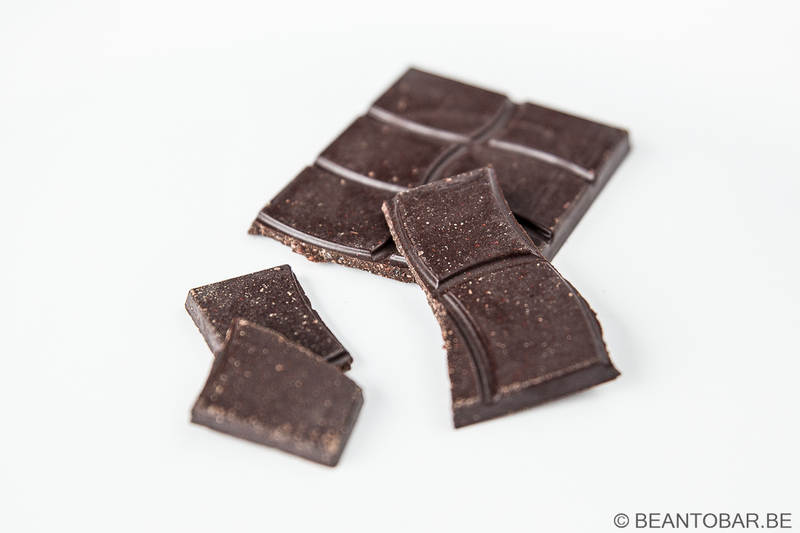 Sadé was started as a response to what chocolate has become to our society. A generic product, made to suit the masses. Stripped from any special flavors, origins, cultural backgrounds. A product without soul. By turning back to it’s very origin (as discovered by the Aztec and Mayan people), Sadé wishes to make people aware of that they are tasting. This bar is made with Columbian cocoa, grown in the Arauca region – close to the border with Venezuela at the heart of where cocoa originated. It is a new cocoa region to me, so the tasting started from a blank canvas. Or should I say palate. From the first impression on, the Sadé bar has Artisan written all over is. The packaging is neatly done. The bar wrapped in silk paper and put inside a thick paper sleeve. The design is simple but elegant and promises intensity, due to the use of dark brown colors and what looks like a wood print. Inside the sleeve, Both in French and English – Sadé explains why their chocolate is different from any other. 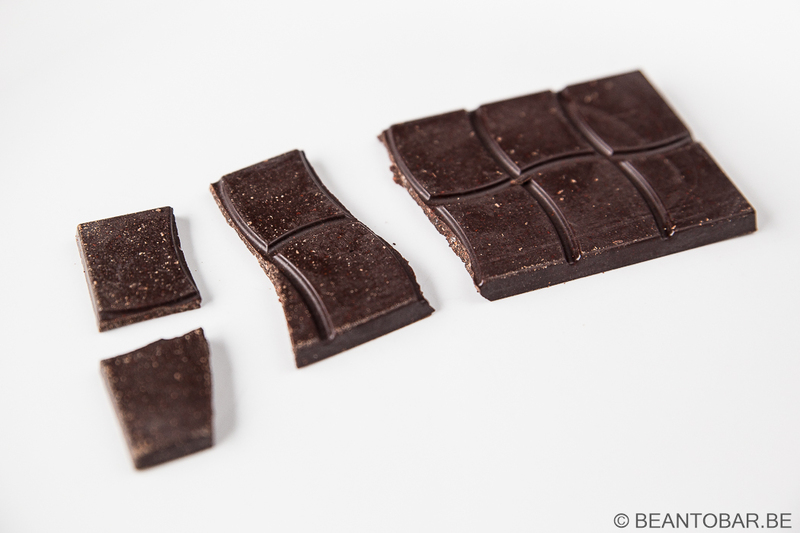 The bar is pretty standard in size and shows elegant scoring in wavy chocolate pieces. The chocolate looks a bit coarse and clearly shows this is not your everyday bar. Taste: An instant flash of coffee and roasted cocoa, abundant in nature starts of the flavor. Molasses flow through. The texture is particular coarse as expected from a non conched chocolate. Little explosions of cane sugar mingle in. The flavor remains very earthy with coffee and roasted cocoa up front, some faint spices in the back. The chocolate melts really quickly. Near the end of the melt, you get the effect of a chocolate bar with added cocoa nibs. The flavor is intense en deep and stays on the palate for an extended time. There is a sudden lactic flavor popping up just at the very end of the melt. I would almost compare this chocolate to an Italian espresso. It is bold and definitely not made to suit the masses, but offers a great experience. The sugar distribution in the chocolate make it very enjoyable given the high percentage of the bar. Sadé doesn’t go for a velvety texture, hence there is no clingy mouth feel from extra added cocoa butter. While starting out tasting fine chocolates, I was learned not to chew the chocolate, but rather let it melt in the mouth in order to experience the flavors locked inside. But this chocolate is very different. Chewing it a couple of times actually enhance the flavor. It releases little flashes of acidity that add freshness. It seems to mingle the ingredients better and delivers more notes when you crush the little cocoa particles in the mass. I get a added nuttiness and more tobacco on the palate when doing so. It is hard to rate this bar. You know up front this is not your average chocolate bar. It states “non raffiné” (non refined) on the package and this exactly what the chocolate is about. I guess many people will be a bit shocked by the texture and intensity, but it is actually pretty close to biting down on a roasted cocoa bean. What has been done to the cocoa beans is just meant to turn it into a chocolate bar. The maker wants it to stay close to the nature of the base product. A job well done I would say. It intrigues me and makes me come back for more. But it is at it’s best when tried solo. If you savour this bar after a more classic chocolate origin bar – the texture difference is so big it looses some of it’s appeal. You really need to take your time to discover this chocolate bar. A real chocolate lover, who knows about the product, will not regret it at all.